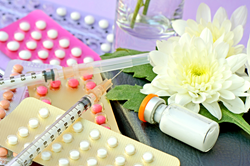 Women who are on the pill or other hormonal contraceptives and who are using remedies which include St. John’s wort may find the contraceptives ineffective due to the herbs interaction with the body, warns Chemist Direct. Combined with other herbs St. John’s wort has been included in treatments to help those who are quitting smoking, certain cases of fibromyalgia, chronic fatigue syndrome (CFS), migraine and other types of headaches. A popular plant that originally grew primarily in Europe before spreading all over the world is the yellow hedgerow known as St. John’s wort. Considered in many countries as simply a weed, this plant has actually been in use for thousands of years as an herbal medicine to treat a wide range of maladies. The European market for the product is said to be worth around £3.75billion a year with an estimated two million people in the United Kingdom regularly using St. John’s wort. St. John’s wort is prescribed as a natural remedy for mild depression and related conditions such as insomnia, loss of appetite, anxiety and fatigue. It is also recommended for heart palpitations, moodiness and other symptoms of menopause, and is used by some naturopaths for mild cases of neurological ailments such as attention deficit-hyperactivity disorder (ADHD), obsessive-compulsive disorder (OCD), and seasonal affective disorder (SAD). Combined with other herbs St. John’s wort has been included in treatments to help those who are quitting smoking, certain cases of fibromyalgia, chronic fatigue syndrome (CFS), migraine and other types of headaches, muscle pain, nerve pain, and irritable bowel syndrome. It is also used for cancer, HIV/AIDS, and hepatitis C. St John's wort also has fewer side effects than prescription drugs with people who were taking it less likely to experience symptoms such as a dry mouth, sweating and dizziness. However, research suggests that it can interact with other, conventional medications.